Made for Fender instruments in a variety of vintage and contemporary models. Originally featured as an upgrade to American Deluxe Series basses in 2004, this bridge features grooved and plated brass barrel-style saddles and top-load or strings-thru-body bridge plate design. 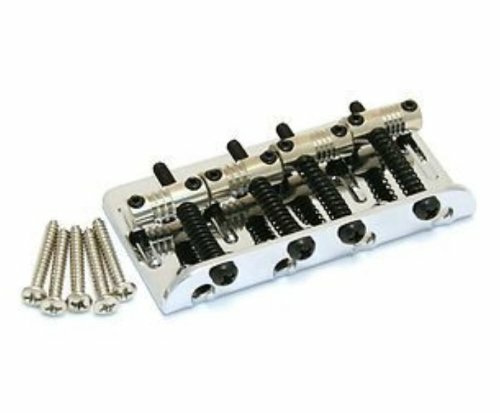 Package includes bridge plate, four barrel-style saddles, saddle height screws, and intonation screws/springs. Does not include mounting hardware or string ferrules. 3-screw bridge mount design. Used on American Deluxe Bass (US) models manufactured from 2004-2010. Will not retrofit directly to a traditional 5-screw mount bridge.